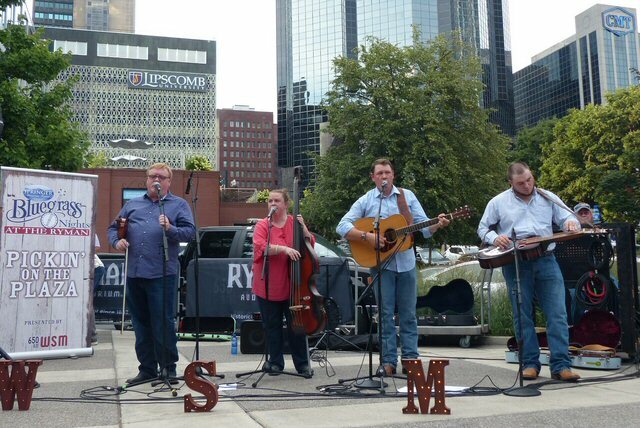 For years the Ryman Auditorium has honored the fact that it is regarded as the birthplace of bluegrass music by hosting their popular Bluegrass Nights Summer Series sponsored by Springer Mountain Farms. The pickin' party started on June 21st and joyfully concluded on July 26, 2018 with the renowned Ricky Skaggs & Kentucky Thunder. 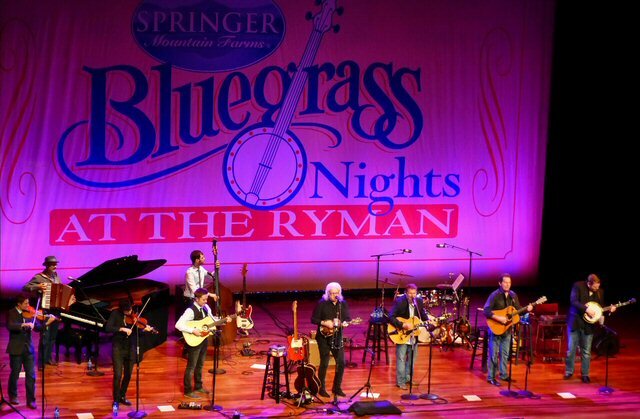 Ricky Skaggs and Kentucky Thunder get rolling at the Ryman. This annual event is a nod to the Ryman's past. 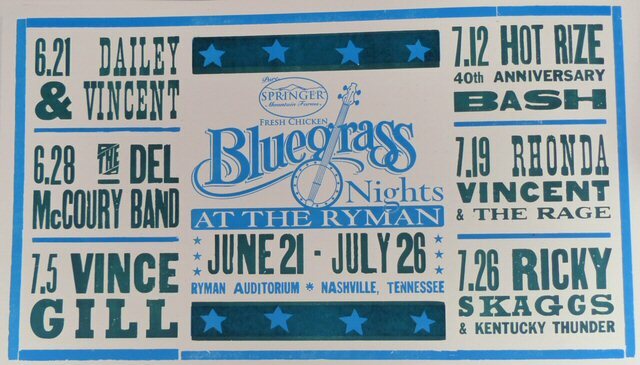 Back in 1945 during a Grand Ole Opry show a young banjo player named Earl Scruggs joined Bill Monroe's Blue Grass Boys on the Ryman stage for the first time. Scruggs added his revolutionary three-finger picking style to Monroe's signature close harmonies, quick tempo, and "high lonesome sound." It was a new and nuanced form of country music that energized listeners and left them wanting more of what would became known as "bluegrass music." 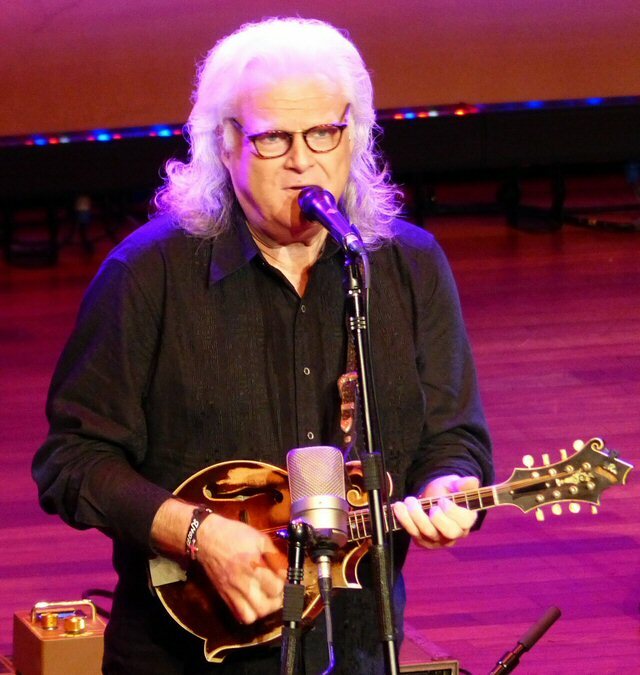 Ricky Skaggs is a direct link to that important part of music history. As the story goes, when the esteemed Bill Monroe came to Martha, Kentucky for a concert, the crowd wouldn't let up until "Little Ricky Skaggs" got up to play. The Father of Bluegrass called six-year-old Skaggs up and placed his own mandolin around his neck, adjusting the strap to fit his small frame. No one could have anticipated what a significant moment that would be in the life of the young prodigy. Within a year, Skaggs would perform with Flatt & Scruggs on their successful syndicated television show, for which he earned his first paycheck. Ricky's course had been set. Decades later Skaggs is an awarding winning artist who will be adding a few more to the list this year. For Ricky Skaggs 2018 might be his biggest year yet. It was announced at the Ryman that in 2018, Mr. Skaggs will be inducted into the Bluegrass and Country Music Hall of Fames. We were reminded that Ricky has helped maintain the traditions of both genres "he breathers it ... he preaches it" declared the MC before the man himself walked out on stage to a warm welcome. After the show Skaggs was available to say hi and sign his books etc. "Glad you are here," greeted Ricky as he and Kentucky Thunder kicked things off with a fast and fluid "How Mountain Girls Love" (The Stanley Brothers) with the Thunder shining on their solos as is the custom in mountain music. Between tunes Skaggs would chat often mentioning Bill Monroe whose songs such as "Bluegrass Breakdown" were covered as part of the group's expansive set-list. After a particularly animated run Skaggs joked that bluegrass should be an Olympic sport as it takes a lot of energy to present the more peppy pieces. For much of the night, Skaggs strummed a mandolin but he also played an acoustic and even a bright red electric guitar made an appearance. The show also had its serious moments that included the moving "I Heard My Mother Call My Name In Prayer" in tribute to the woman who taught Ricky the love of Jesus. He also thanked his father who gave him the gift of music. After a short intermission Kentucky Thunder were joined by a few more musicians as Skaggs presented a set of country favorites. Fans did not seem to mind the departure as they were treated to "Crying My Heart Out Over You, "I'm Tired" along with other hits from Ricky's country periods. Another season of the Bluegrass Nights Summer Series is successfully in the books. Thursday was a night of tributes and the next person to be recognized was Buck White. A number of mandolin players joined Ricky to honor the man who had influenced them. This part of the concert featured "Down Home Waltz", "Old Man Baker" and more. Other high points of the career spanning concert showcased the compelling "Can't Shake Jesus" followed by the barn storming "Old Barnes" flowing into "Black-Eyed Susie". For the encore, Ricky was joined by his wife and sister. He asked the crowd to stand so we could be the chorus for the gospel medley of "Nothin But The Blood", "On Christ The Solid Rock" and "Blessed Assurance." The acoustics of the Ryman were ideal for these vocal numbers. Kentucky Thunder "ripped it up" on the bluegrass classic and closer "Rawhide" with accompaniment from guest Buddy Green to end the night and series on a joyous note. The Ryman Auditorium aka the Birthplace of Bluegrass is considered one of the best sounding rooms in the States. The hall continues to pay tribute to its past but it is very much in present with the following upcoming events - Dave Barnes, Alejandro Escovedo, Gordon Lightfoot and Joe Bonamassa. There's chicken and pickin' on the plaza before the show.